The beautiful city of Buenos Aires is known as the „Paris of South America“ due to its lovely green parks, plazas and wide boulevards. Explore the quirky neighbourhoods and artistic markets of the city, where European and Latin American influences have mixed together to create a city like no other. To make sure you see as many of the city’s historic sites as possible in the time available, we suggest taking a sight-seeing bus, which you can hop on and off as you wish. 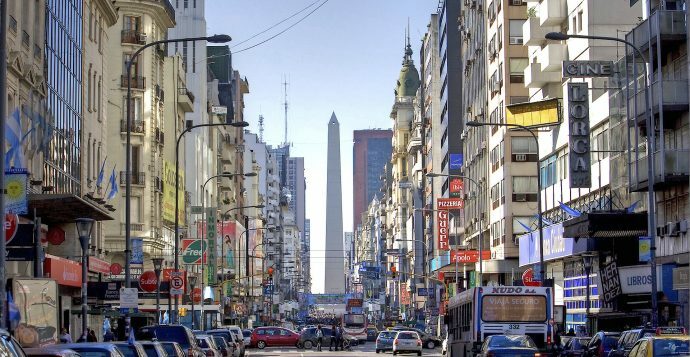 You’ll see Avenida 9 de Julio (the widest avenue in the world), the impressive Teatro Colón, one of the world’s best opera houses, and the famous Casa Rosada, Argentina’s presidential palace, from where Juan and Eva Perón famously addressed the crowds gathered on Plaza de Mayo in 1945. We head to Mendoza is where General José de San Martín organised the army with which he liberated Chile and Peru from Spanish rule in 1818. Unfortunately, few historic buildings remain after an earthquake devastated the city in 1861. However, the city was rebuilt on a grid system, resulting in the broad tree-lined streets and beautiful green plazas for which the city is famous. There are great views from the top of “Cerro de la Gloria” at Parque San Martín. Situated on the foothills of the Andes, the city is a great base for some optional outdoor activities, such as white-water rafting and rappelling. But of course no trip to Mendoza would be complete without touring the surrounding vineyards. You can hire bikes and cycle the ‘Ruta de los Vinos‘ (wine route), visiting both ancient cellars and working wineries – tasting some of the world’s best Malbecs en route. We enjoy a scenic drive into Santiago. Santiago is a very clean, modern city with many fountains and parks, but also has its own turbulent history. It is well-known for its fresh markets such as the famous La Vega Central Market, and the Mercado Central, one of the best seafood markets in the world. You can see the changing of the guard most days outside the impressive Palacio de La Moneda, the seat of the President of Chile. In the 1970s, the palace was bombarded during the military coup d’état, ushering in a dark period in Chile’s national history. For the best views of the city, take a funicular railway or hike to the top of San Cristobal, where the Statue of the Virgin overlooks the capital and the distant Andes. Here you can taste some of Chile’s best wines and find some beautifully situated swimming pools. We fly along the Pacific coast to the north of the country and transfer to San Pedro de Atacama. This is a picturesque small town that looks like it has come straight from the scene of a Western with its single-storey buildings, white-washed walls and dusty roads. The Atacama desert that surrounds the town offers some of the clearest skies in the world and as such is used by international space agencies to monitor the skies. If it is a clear night, the starscape viewed from San Pedro de Atacama will most likely be the best you’ll ever see. The next day we head into the desert, exploring the Valley of the Moon by 4WD. This area is famous for salt-covered lunar landscapes, interesting rock formationas, smoking geysers, salt flats and hot volcanic springs. We continue our 4WD expedition and cross the border into Bolivia, into some of the most remote areas of the Bolivian Altiplano. You will see a variety of dramatic landscapes including smoking volcanoes, barren deserts and gravity-defying rock formations carved by the wind. In this incredibly empty landscape you’ll most likely feel the furthest from civilisation you’ve ever been. You will visit a number of lagoons including Cañapa, Chairkota and Laguna Honda. You will also get to see the Laguna Colorada, which offers some truly breathtaking scenery, with several varieties of flamingos gathering in the shallow waters of the beautiful crimson lagoon. Before arriving at Laguna Colorada you will pass Arbol de Piedra, the famous Stone Tree. The next morning we embark on an exhilarating three day 4WD tour to explore the Salar de Uyuni and the striking landscapes that surround it. First on the agenda is a visit to the Train Cemetery, where you can see the remains of 19th and early 20th century steam locomotives – a good place for artistic photographs. We will then come to Colchani, the main plant for the iodisation of salt and the best place to observe the methods of salt extraction from the salar. Here ovens are used to dry the salt, which is then formed into cakes. From here we drive onto the Salt Flats themselves. Claimed to be the largest salt flat in the world, the brilliant white vast Salar de Uyuní, which covers some 10,500 square kilometres and is estimated to contain 10 billion tons of salt, looks like something from a surrealist painting and its seemingly infinite horizons will amaze you. You will then visit either Fish Island or Incahuasi Island (seasonal dependent). Located in the centre of the Salar, 100 kilometres from Uyuní, this hilly outpost is covered in giant cacti amid a flat, white sea of hexagonal salt tiles.The otherworldly views from the islands will take your breath away, with the brilliant blue sky (weather permitting of course) contrasting with the pure white of the salt flats. After enjoying our time at the Salt Flats we head into the town of Uyuni where we can compare our photos! 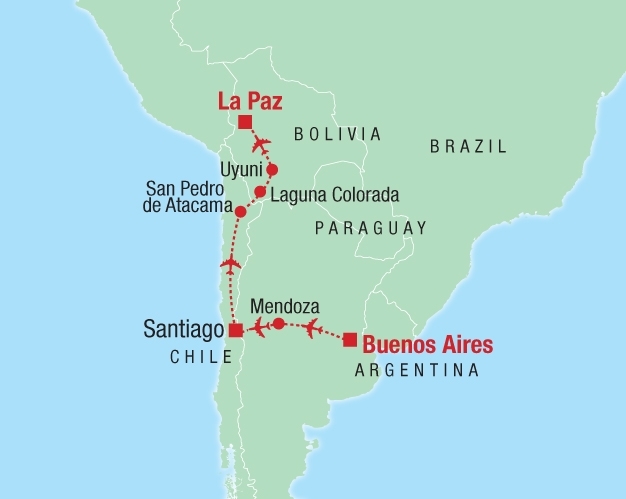 We fly across the country from Uyuni to La Paz. If it is a clear day, you will be able to see the huge expanse of the Altiplano as you fly over the landlocked country, perhaps seeing the Andes slowly flattening out to become the Amazonian basin, which spreads to the far East of the country, to the border with Brazil. Nestled in a steep valley that protects its inhabitants from the harsh elements of the Altiplano, La Paz makes for a striking cityscape, with bare-brick houses and tall skyscrapers seemingly built on top of each other in front of a dramatic mountainous landscape in the background. Our hotel is very centrally located, close to the city’s colourful indigenous street markets including the fascinating and suitably named „witches market,“ where women wearing bowler hats and flared skirts sell strange paraphernalia said to ward off evil spirits. The main square, Plaza Murillo, is also within walking distance. The square still retains its colonial buildings including the Presidential Palace. La Paz is possibly the best place to experience a traditional peña show of Andean music and dance, where local bands play time-honoured instruments such as zampoñas (pipes) and charangos (similar t to a ukulele). Diese Tour startet mehrmals im Monat und beinhaltet 11 Übernachtungen in Hotels und 2 Übernachtungen in Gästehäusern.